My thirst for new books is never-ending and probably ill-advised at this point, but it has prompted me to join a group called TBRindr, which matches reviewers with indie authors who are in need of reviews. And I was soon to get my first request, from an author by the name of G. R. Matthews. He has sent me two books to look at, the first of which is Silent City. 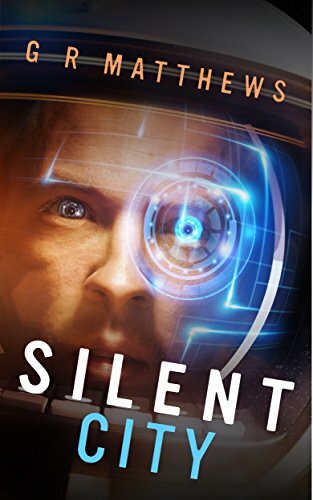 Silent City follows Corin Hayes, a down-and-out ex-soldier whose only remaining comfort is to be found at the bottom of a bottle. Following the murder of his daughter and a subsequent industrial accident that he was responsible for, he has been living paycheck to paycheck. One day his regular drinking spot is intruded on by Devra, a representative of the corporation running the underwater city that he lives in with a tempting offer: a regular job that makes use of the valuable skills that he came out of the military with. But on his first job with them, he soon finds things going horribly wrong. Sometimes you hear horror stories about books that have been independently published, particularly with regards to lack of quality. So I'm quite glad that my first review for TBRindr has been such a solid entry. I'm going to start with something that I don't usually focus on first: the worldbuilding. For me, Silent City hits pretty much the perfect note when it comes to developing his world and balancing it against the characters and plot. My main complaint with a lot of books that have very strong worldbuilding is that the characters and plot can seem underdeveloped or boring in comparison, which is rarely what you want to read. With Silent City, there weren't the sort of long and complex information dumps that make me want to throw a book across the room. Additionally, it was a setting that I haven't seen explored much, which makes me intrigued to see more of it. A severely diminished humanity that must hide in pressurised domes beneath the sea, with no hope of returning to a surface that has been poisoned beyond human intervention? I am so there, thalassophobia be damned. That leaves the plot and characters. The plot is going to be rather difficult to discuss without quickly getting into spoiler territory. I will say that, on the whole, I enjoyed it and found it quite tense in places. I would have liked a few answers at the end, but as this is the first in a series I think I can forgive a bit of mystery being set up. Which leaves characters yet to tackle. Silent City is a first-person narrative, and it definitely falls prey to one of the primary problems with this particular point of view: beyond the main character, Corin, the characters aren't really fleshed out all that much, and what we do get is coloured by Corin's personal biases. That's not necessarily a bad thing, but it would be nice to get a better idea of who some of the other characters in this interesting world are before they get their lungs crushed by massive water pressure. As for Corin himself, he is the sort of character that wouldn't look out of place if he were transplanted into 1930s America or other setting suited to the Noir genre. He's hard-drinking, dour and down on his luck, but stubborn and tough enough to fight his way through the sticky situation that he manages to find himself in. Not the most original of characters perhaps, but he's well-written and has a potential soft centre that could be entertaining to uncover.